For the last 10 years I have been a product manager at startups and now at a major networking company. My primary role is to engage with customers and users to generate requirements and communicate those requirements with engineering. It's a great role and I sell a lot boxes. However, commercial software is limited by the hierarchical nature of the corporations involved. The user - developer relationship is also restricted by the need to generate revenue. The more a customer will spend, the higher priority we give their requests. Open source development addresses those limits with a decentralized and non-hierarchical model. The decisions about what gets built are informed by the developers own experiences and by developers responding directly to input from users. Thus, open source has significant advantages for developing software and hardware for a constructionist educational system. That said, any development model needs an optimal process for synchronizing the work with the users expectations. Developers don't fully understand user's daily activities and users don't fully understand the constraints of the development process. Even for open source, the challenge remains how best to achieve a problem-posing methodology of mutual education. Both sides need an efficient way to engage the praxis (action and reflection) of creating relevant applications. Transformation of the process from developers giving users features (banking method) to developers-users learning from each other (problem-posing method) needs attention that empowers all to participate. That challenge is especially acute when there are larges gaps of culture, age, economic status, language, and geography (urban - rural and north - south). Even as users learn to develop their own code, there's a need for all users to have a say in what gets prioritized and delivered. Find the curriculum of a school getting laptops and investigate the educational goals of teachers and students. Find contacts at the school or in the education department. Brainstorm with the teachers and school system about what ways they can use the XO to further their curriculum goals. Uncover any new development and support needed on the XO or supporting applications (e.g. school server, public web pages) to achieve the goals of the school. Work with the schools, open source community and others to build the needed applications. Deliver examples and get input from students and teachers on its usefulness. Document the process, reflect on it, improve it and see if other schools can benefit. The hardest part may be building trust relationships between developers in the US and educators in Uruguay. We need to be very careful not too give the impression we can deliver on any part until we know for sure. We also need to be careful not to appear to represent OLPC itself. I will start by reading about the curriculum and education in Uruguay on the Ministry of Education site. I'm also looking for comments, questions and input from XO users and teachers. I think we need a long period of research on step 1 before we move on. I'll post updates on how it goes here and let me know if anyone else is working in this direction already or wants to participate. This post was submitted by Greg Smith. 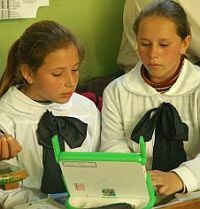 If you too want to add your voice to OLPC News, write a Guest Post today. I have been a developer for over 10 years and I have noticed that 1 in 10 people involved in the process add value and the other 9 talk about documenting the process. Please keep people like Greg out of the process along with the other 9 out of 10. To be fair to the author, I think that he was mostly expressing an interested in producing a product that meets the needs of its users. Is it going to be important to micromanage the development of curriculum oriented software for the OLPC? Something tells me that the scope of most of the projects is going to small enough to negate that need. I also wonder if it is a good idea to make the OLPC a curriculum driven product. Sure, that is going to help convince governments to buy into the OLPC. On the otherhand, I've found that strict adherence to the curriculum allows for little creativity on the part of the student or the teacher. 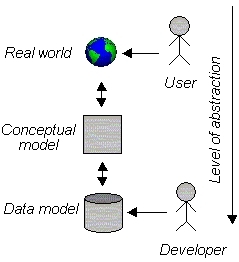 Thats all fine and well, but why does the Developer through the Conceptual model in the trash can? "The hardest part may be building trust relationships between developers in the US and educators in Uruguay". There should be many tools available for the educators in the world. In Uruguay we are building our own tools, and developing many different applications as well as taking tools from other places. I appreciate the feedback. The range of comments definitely shows the challenge and the opportunity. Doug wants to decide what to build on his own. In that case the students and teachers will need to learn in the way Doug thinks is best. Unless the developers and users work together any applications built wont be relevant and wont transform the educational process for the benefit of the children. On Jordan's comment, I agree. I meant curriculum to represent the educational goals of all involved. That includes the governments, school systems, systems integrators, teachers and students. We need a way to uncover those goals. That should come from a dialog, primarily between students and educators but in this case it can also include developers. I suggest a Freirian approach http://en.wikipedia.org/wiki/Paulo_Freire but I'm not and educator myself so I will rely on the people actually doing the learning and the teaching. I'm most excited by mikeb's comment. Uruguayan's can teach a lot of people, including me, how to listen better and how to engage in a meaningful exchange! I'd like to know what applications and tools are getting the most interest in the XO deployments so far. Any input on what works well for students and what doesn't would be great. Also, any suggestions on top priorities from an educational or a development perspective are appreciated. Leo y hablo a español si usted prefiere. Perhaps you can send me an e-mail via Wayan and I'll start reading the http://www.latu.org.uy/ web site too. Thanks for all of the comments. I've learned a lot already! Check out moodle (moodle.org). It's open source course management software (hopefully OLPC will be working with that community!). They've actually dealt with / are dealing with issues very similar to what you're talking about. One thing you'll notice on the Moodle forums is that much discussion, solutions, programming and ideas comes from the countries with the most open source OSes (read "Linux"). That's not the US! Microsoft has put us pretty much last in that game. Thanks for the link, Wayan! Interesting article. It's great to see how many people have already made the OLPC - Moodle connection. The two really seem to be made for each other. I see ghosts of Christmas past... I recall handing Uruguayan President Lacalle a plan to input contents for the Middle school level at a cost of US 20.000 around 1993, when a donation of computers from Spain enabled a computer lab to be built in every capital city (19 of 'em). Never got an answer. Of course I was a crazy idealist, and I might still have a lot of that. The price now probably went up tenfold, but it's still a drop in the bucket, which nevertheless is unlikely to be faced. I second totally the need to build trust with local users. Which is well night impossible, since they lose "face" when the kids know more than they. The very lack of localized content simply enhanced that divide, since the teacher has no way to assign drills or "class" related work, except in the most generic terms (maybe have the kid write a paper on something she taught in class?). Nevertheless it needs to be done, or else if we dig enough we might find out that the OLPCs sit unused or even outlawed from the classroom. BTW, anyone can point us to any website built by OLPC users in 'guay? BTW Greg, if you have luck finding details for curriculum for Uruguay, would you share the URL? The Ministerio will get you nowhere, since curriculum is run by the ANEP, which has no public oversight whatsoever and thus tends to get away with being secretive in this kind of things. I'm curious if Astronomy is still mandatory for every 10th grader in the land, as it was when I taught it. French used to be mandatory in those days also (English optional after 10th grade), but that got changed.